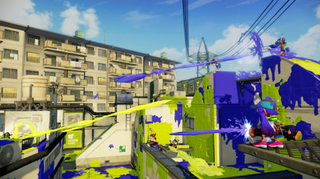 Hope You Like Heights, As the Flounder Heights Map Joins The Splatoon Rotation! The new map which was teased in the Nintendo of Japan August Update Trailer, is set atop of the rooftop of an apartment complex and it’ll be available tomorrow at 7PM PST. Try as you might, you can’t ignore the apartment building in the middle of the map. It stands like a gigantic wall, looming over the battlefield like an ominous, erm, an ominous… apartment building, I guess. Will you make your stand in a hail of ink on the rooftop? Will you try and sneak your way through the middle? Whatever your strategy, there’s no getting into enemy turf without getting past this monolith.